* Campus Life – What’s it like being on a production crew at Pixar? 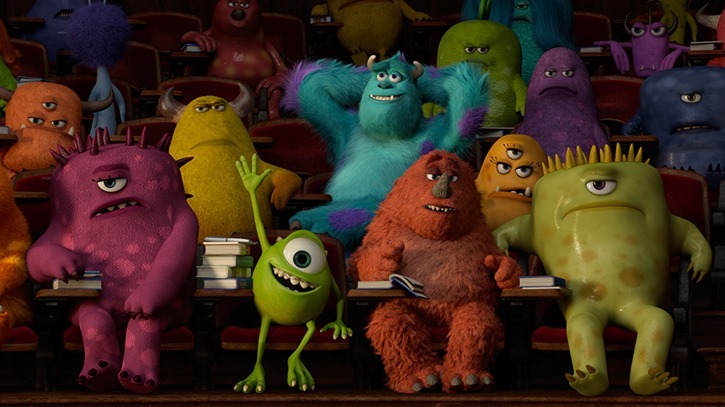 Get a look at a day in the life of the “Monsters University” crew through their own eyes. * Story School – This documentary examines the challenges of creating a prequel as well as themes that run through the story, and the change in focus from Sulley to Mike. We’ll also look at how gags are developed – from writing jokes to brainstorming a million ideas, only 5% of which actually end up in the movie. * Scare Games – At Pixar, we play hard while we work. The same people who keep the film production moving – producers, managers, coordinators and artists – are also the ones who bring spirit and excitement to some of our extracurricular activities. We check out the MU production teams as they go head to head in the mostly playful Pixar Scare Games competitions. * Welcome to MU – Sets aren’t just buildings, they are the worlds our characters live in and explore. 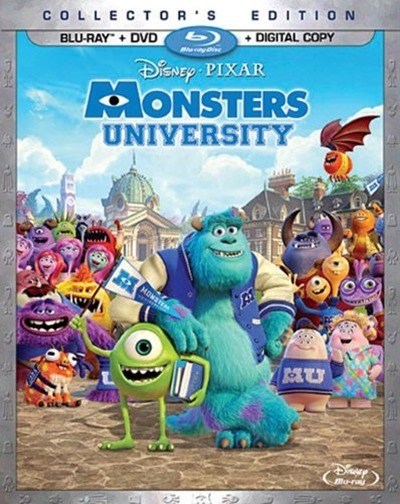 This look at the Monsters University campus and its development is told from the perspective of the artists who created each piece of the campus from the architecture to the ivy leaves. .
* Music Appreciation – Randy Newman’s scores are a mainstay of Pixar films, and this documentary will give you a privileged look at his creative process. We follow the “Monsters University” scoring process from spotting to writing and on to the scoring session. including special college-themed recording sessions. * Scare Tactics – Animators are actors who digitally bring the characters to life. In this look at how the MU animation team worked, you’ll see their process of how they channeled their own monster-selves and created moments on screen that were really funny, really scary and also really serious, sometimes all at the same time. * Color and Light – How can a single painting set the tone for an entire scene? We’ll look at the creation of the colorscripts and how they were realized technically in the final film. Along with the process, this piece explores the many layers of technical innovation required to produce such a naturalistic feel. * Paths to Pixar – MU Edition – When one door closes, sometimes another door opens – one with an even more exciting opportunity behind it. Members of the MU crew tell their own compelling backstories and share the challenges they overcame along their paths to Pixar. * Deleted Scenes – Four separate scenes – “Rivalry,” “Recon,” “Movie Night,” and “Drama Class” – are highlighted with an introduction from director Dan Scanlon. * “The Blue Umbrella” – This animated short film from Pixar Animation Studios, directed by Saschka Unseld and produced by Marc Greenberg, played in theaters in front of “Monsters University.” “The Blue Umbrella” tells the story of an evening commute in which the rain starts to fall and the city comes alive to the sound of dripping rain pipes, whistling awnings and gurgling gutters. And in the midst, two umbrellas—one blue, one not—fall eternally in love. * Additional Bonus Features – Audio Commentary, Promo Picks, College Campaign, Theatrical Campaign, Set Flythroughs, Art Gallery and more! I was so excited when they first announced Monsters University. Monsters Inc. was and has been one of our families favorite movies for quite some time. It’s creative, simple yet funny (even for adults). I couldn’t imagine how a prequel would be any better, but I had my fingers crossed. Disney/Pixar hit the nail on the head with this one! The characters are even cuter as little guys, the storyline keeps you drawn in and it’s fun to see the “underdogs” finally get their day. I hope to soon have a movie day and watch this back to back with Monsters Inc. to get the full picture, but even at the end of Monsters University they tie the movies together with a cute little photo montage. This one will remain in our library for years and years to come. This would make a great stocking stuffer for my son this Christmas! We still haven’t seen the movie but I know he will love it! I haven’t seen this yet, but it is on our Christmas list. I’ve heard really good things about it. This Monster’s Movie is such a good animated movie that my family really loves. The characters are so cute and funny. This movie is a classic that can be watched over and over! We just rented this movie the other night. It was cute! I think I liked the first one better, but this one was good, too. The first one was funnier. We didn’t check out the bonus features, though! My kids REALLY wants to watch this, I definitiely have to keep my eye out for a great deal. This is a really fun cartoon, I will definitly let my baby watch it! Great information about the Blu Ray! I love monsters Inc and can’t wait to see this one. It looks so cute and the trailers make me want to watch it right now!